You must be a member of the Kiev Culture Group to attend this activity. Would you like to join this group? I am coming to Kiev for the weekend of Protected content and it would be too pity not to attend any Musical Activities once I am in Kiev. 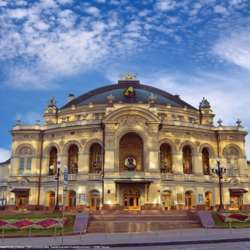 Therefore I decided to book a ticket for the Musical " Zaporozhian Beyond The Danube". The Musical will start at 19:00 but as its adviced to be there half an hour in adance we have to be at the theater entrance at 18:30 ish. The place is reserved for: Kateryna Albatross. Please for this reservation name for 17:00 at the entrance.